This weekend, the National Alliance of State and Territorial AIDS Directors (NASTAD) released a statement that signifies an extremely important development in the Positive Justice Project's campaign to repeal HIV-specific criminal laws in the United States. NASTAD is a highly-respected organisation of public health officials that administer state and territorial HIV prevention and care programmes throughout the US. Its motto is: 'Bridging Science, Policy, and Public Health'. advocate at the national level to raise awareness of this urgent issue. Realizing the vision of the NHAS is predicated on a strong foundation of public health science and practice void of stigma and discrimination. Instead of applying criminal law to HIV transmission, state and local governments should expand programs to reduce HIV transmission while protecting the human rights of people living with HIV. Provide unequivocal public health leadership on the relative risks of transmission and the dangers of a punitive response to HIV exposure on the epidemic. Todd Heywood of the Michigan Messenger reports that US HIV advocates - including the National Association of People with AIDS (NAPWA) and the Positive Justice Project's Senior Advisor, Sean Strub – have warmly welcomed NASTAD's statement. Read his report at the Michigan Messenger here. The full text of the statement, below, can also be downloaded as a pdf. The National Alliance of State and Territorial AIDS Directors (NASTAD), the organization which represents the public health officials that administer state and territorial HIV/AIDS and adult viral hepatitis prevention and care programs nationwide is gravely concerned about the corrosive impact of sustained stigma and discrimination on state, federal and local efforts to combat HIV/AIDS in the United States. The National HIV/AIDS Strategy (NHAS) provides an unprecedented strategic blueprint for reducing HIV/AIDS incidence through the scale-up of interdisciplinary, impactful prevention approaches. NASTAD acknowledges that the NHAS is not a magic bullet; however, the NHAS’ central vision of the U.S. becoming “a place where new HIV infections are rare” cannot be realized until the nation aggressively responds to the core of the matter: pervasive and unmitigated stigma and discrimination against people living HIV/AIDS that diminishes our best efforts to combat one of the greatest public health challenges of our time. As a member of the Positive Justice Project, a coordinated national effort to address “HIV criminalization” statutes – laws that create HIV-specific crimes or which increase penalties for persons who are HIV positive and convicted of criminal offenses – NASTAD supports efforts to examine and support level-headed, proven public health approaches that end punitive laws that single out HIV over other STDs and that impose penalties for alleged nondisclosure, exposure and transmission that are severely disproportionate to any actual resulting harm. Steps identified to reach this goal in the Federal Implementation Plan include step 3.3, Promote public health approaches to HIV prevention and care which states that “state legislatures should consider reviewing HIV-specific criminal statutes to ensure that they are consistent with current knowledge of HIV transmission and support public health approaches to screening for, preventing and treating HIV.” In addition, step 3.4, Strengthen enforcement of civil rights laws requires an examination and report by the Department of Justice on HIV-specific sentencing laws and implications for people living with HIV. A woman with HIV in Georgia, who was sentenced to eight years imprisonment for failing to disclose her viral status, despite it having been published on the front page of the local newspaper and two witnesses who testified her sexual partner was aware of her HIV positive status. In none of the cases cited was HIV transmitted. In fact, most prosecutions are not for transmission, but for the failure to disclose one’s HIV status prior to intimate contact, which in most cases comes down to competing stories about verbal consent that are nearly impossible to prove. NASTAD will continue to advocate at the national level to raise awareness of this urgent issue. Realizing the vision of the NHAS is predicated on a strong foundation of public health science and practice void of stigma and discrimination. 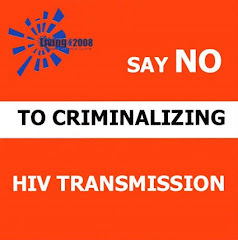 Instead of applying criminal law to HIV transmission, state and local governments should expand programs to reduce HIV transmission while protecting the human rights of people living with HIV.